Whitney Perkins (left), a teacher at Southwest Junior High, gets a free stapler from Julie Shook with Arvest Bank, who's daughter attends Southwest, Thursday, Aug. 9, 2018, during the 52nd Annual Sam's Furniture Springdale Teacher Appreciation Day at Springdale High School. Arvest Bank was handing out free staplers to teachers at the event. 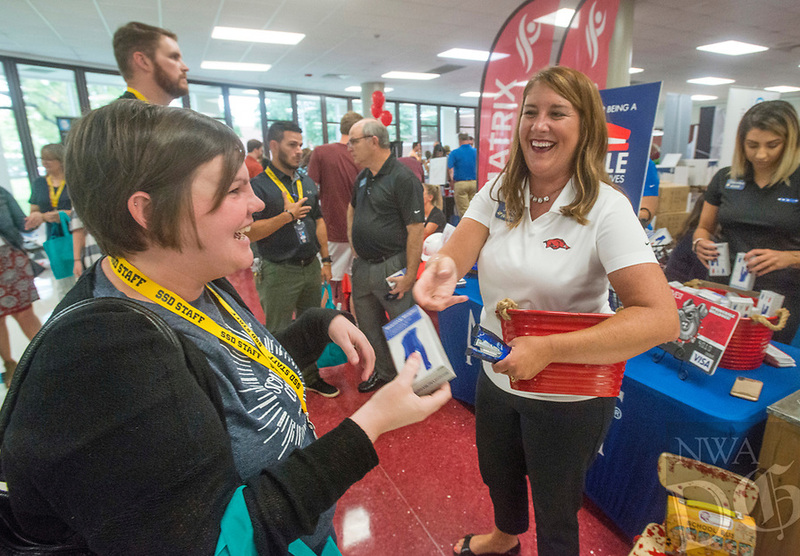 More than 85 vendors set up to provide information and more than $40,000 in gifts and prizes to some 2,000 teachers and staff of Springdale Public Schools.